The citizens and community members in Oregon's city of Southwest Portland have had enough of the so-called "activists" harassing their communities. Ever since the #OccupyICE hashtag began trending, radical leftist extremists have been taking to ICE facilities across the country to block the organizations from operating and doing their duty. Wednesday morning, Portland police cleared the last remaining protesters from a shoddy encampment at the Southwest Portland offices of the federal Immigration and Customs Enforcement agency. The protesters swelled in size to provoke fears that the situation could get out of hand and police were dispatched to control the violence. At the peak of the protests, ICE employees were unable to even go to work because they could not reach their offices due to the protesters surrounding the buildings. The protests lasted five weeks and about a dozen of them were all that was left on Wednesday and even they were forced to leave by authorities. 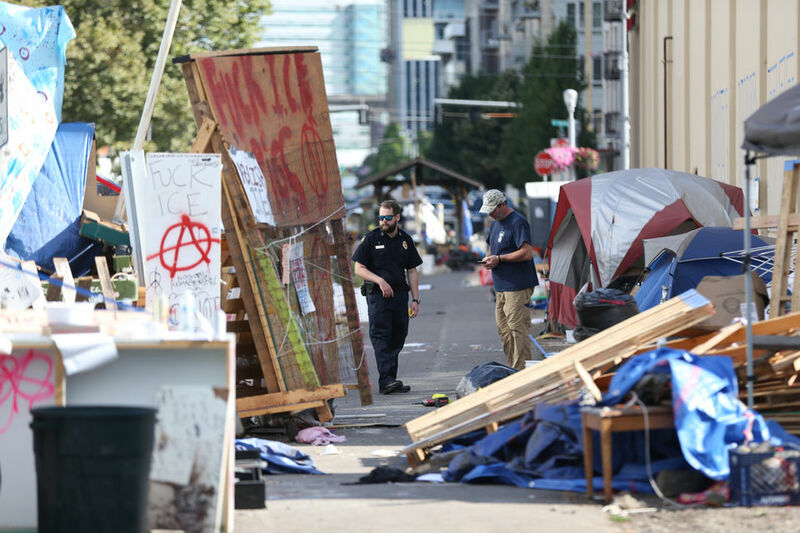 Aside from preventing community members from reaching their jobs and blocking traffic, protesters left behind a literal dumps worth of trash at their encampment. Portland officers assisted in the clean up near Southwest Macadam Avenue and Bancroft Street. At its peak, the protests swelled to hundreds of members but were quickly met with resistance from officers who formed barricades to protect the federal agency. Portland Police Chief Danielle Outlaw held a news conference at the site of the protests Wednesday saying, "We knew we had to get ahead of it before it spiraled out of control." Portland is a leftist pos. they deserve what they get. Mike Cooper was just pissed that he couldn't get a sammy while he engaged in the block ICE shitshow. That is the Liberal Left like Anti-Farts. NO CIVILITY. Just gutter trash. I know who is going to be pissed. The parents of these snowflake protesters who live in their parents basements. Those are the ones who I feel sorry for!